FILE PHOTO: The new Audi A8 is seen during a presentation at the Audi Summit in Barcelona, Spain, July 11, 2017. FRANKFURT - German carmaker Audi is taking a lead in bringing more automated driving to roads, but rivals seem in no rush to follow while legal and regulatory uncertainties still cloud the technology. At the Frankfurt car show, Audi paraded the A8 which can drive itself under certain conditions, decide when to change lanes and does not require drivers to monitor the road - though they must be ready to intervene at the sound of an alarm. On a scale where zero is a fully manual car and five a fully autonomous one, the A8 is a level three, putting it ahead of level two features offered by Tesla and General Motors (GM). Struggling to emerge from the shadow of parent Volkswagen’s diesel emissions scandal, Audi is badly in need of a new prestige model and a marketing coup. “It’s gratifying that we are able to set a positive sign for real ‘Vorsprung durch Technik’,” said research and development chief Peter Mertens, referring to Audi’s advertising slogan meaning “advancement through technology”. But with special approval still required almost everywhere to drive such a car, and question marks over how quickly the driver has to take back control - and who is responsible during handover - some rivals are skeptical the market is ready. “Who will accept to pay for something that they can use only in extremely limited conditions?” asked Didier Leroy, European chairman of Japanese carmaker Toyota. “The fact that Audi is introducing this one now doesn’t mean that we will rush in the coming months to say that we are able to do it too. That is not our logic,” he told Reuters at the car show. 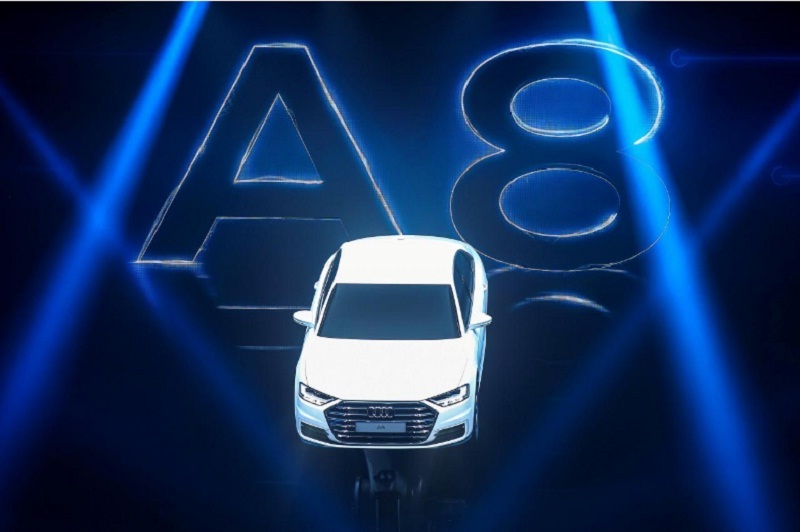 Among the A8’s new features is the “traffic jam pilot”, which can completely control driving at up to 60 kilometers (37 miles) per hour on a divided highway. The German company expects customers will be able to use all the model’s self-driving functions next year or in 2019. It is applying for approval country by country, starting with Germany, a spokesman said during the show. Audi thus hopes to leapfrog Tesla, whose Autopilot technology suffered a major blow when a driver using it was killed in a crash, and GM, whose Super Cruise feature to be offered this autumn will allow limited hands-off driving at highway speeds on limited access roads like dual carriageways. In the wake of the crash, Tesla said the driver was using Autopilot in conditions for which it was not intended, and U.S. regulators said automakers should take steps to make sure semi-autonomous systems are not misused. Regulatory regimes vary widely across the world and, in the United States, even from state to state, creating a headache for manufacturers. Some authorities would rather they held back. “We’re very concerned about the idea that drivers will be encouraged to pay even less attention than they already are and that manufacturers are rolling out these systems without existing federal standards,” Linda Bailey, executive director of the U.S. National Association of City Transportation Officials, told Reuters. Florida, seen as the least restrictive state, has essentially legalized all forms of autonomous driving without the need for a permit or insurance requirements. New York, at the other end of the spectrum, has a law that demands drivers always have at least one hand on the wheel. Michael Jellen, president of Velodyne, which develops lidar sensing technology that is used in autonomous cars, said the industry still had a long way to go. In Europe, Germany is the pioneer, having passed a law in May that legalizes autonomous driving in principle as long as a licensed driver is behind the wheel - although approval still has to be sought for individual models. German politicians hope to persuade the European Union to adopt common regulations to speed adoption of autonomous driving and prevent self-driving systems from having to switch themselves off or change parameters when they encounter national borders - so-called geofencing. German Transport Minister Alexander Dobrindt hosted ministers from France and Luxembourg at the Frankfurt show on Thursday to establish a cross-border testing ground. In an attempt to address one area of uncertainty, Audi says it will assume liability for any accidents that happen when its automated driving technology is in use. But it will come at a price. While Audi has not yet fixed premiums for level three technology, the base price for the A8 without optional extra technology is already 90,600 euros ($108,000). Though level three, unlike level two, means theoretically the driver need no longer monitor the road while the car is in charge, the need to potentially jump in to take control limits the activities the driver can do when not in charge. A risk is that drivers relax their guard too much. “It sets an expectation to the driver that the computer is in control - that’s what level three means. It means I can sit back and read a book,” said Gartner analyst Mike Ramsey. Autopilot features have long been used in aeroplanes, but the situation is very different there, where a pilot typically has plenty of time to react. “It’s very, very rare to face another plane coming just in front of you and just to react in two seconds to avoid a crash. In the car, it’s possible,” Toyota’s Leroy said. Even then, the hand-off from computer to pilot can be bungled, resulting in crashes such as an Asiana flight into San Francisco in 2013 that killed three people and injured scores. Some question the worth of introducing level three at all at this stage. German automotive supplier Continental, with 1.2 billion euros in assisted driving component sales last year, said industry experts were questioning whether the grey zone in which neither the driver nor the car was clearly in control could be overcome. “There is a discussion going on at the moment as to whether one shouldn’t skip level three after implementing level two,” Chief Executive Elmar Degenhart told Reuters at the show. Bosch [ROBG.UL], the world’s biggest automotive supplier, said it was seeing great demand for level three technology. Yet at its presentation at the show, it did not talk about autonomous driving in general, but rather only particular applications to solve particular problems, such as an automated valet parking garage it has built with Mercedes maker Daimler in Stuttgart, which should go into service next year. France’s PSA Group, which is developing autonomous driving technology with partners for its future Peugeot, Citroen, Opel and DS vehicles, said there was still value in technology that needed human oversight and regular intervention - with the right framework of rules. German carmaker Audi is taking a lead in bringing more automated driving to roads, but rivals seem in no rush to follow while legal and regulatory uncertainties still cloud the technology.